Thanks so much for these tips! 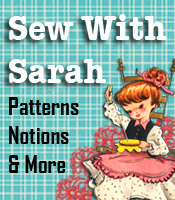 You make it sound “sew” easy. I added you to my favorites at technorati so I can find you easily. Think I’ll subscribe too. wow. that is cool. I think the hard problem will be looking for the jeans. If anyones having trouble finding some , TRY E-BAY!!!!!!. They have TONS for a low price. happy sewing! Thanks for the note Nicole. You’re right, eBay is a great place to buy used jeans. I’ve also found them super cheap at yard sales, flea markets and Good Will. Sometimes yard sales that advertise “children’s clothing” will have stacks of them for a quarter or fifty cents each, and I stock up when I see those deals!!! Just watch the newspapers for what’s listed at yard sales. On the other hand, eBay can be done anytime day or night from the comfort of your own home. I love the idea, i wont be throwing out any of our old jeans anymore. I also love designing purses and this is a great idea especially since your recycling the jeans. You could even save the scraps for a quilt or something similar. I made one for my daughter and she used it for years! I made Jeans Purses over 30 years ago for my daughter-in-law and several others young women hanging around my home at the time. My daughter-in-law still has hers and uses it often when going to a park or amusemnt park. People still comment on it when they see it. She said I was way ahead of my time when they became a big fad lately. I had already made a jean bag for my Associate when I was at work. The Director from the Recreation Dept. asked me to make a jean bag for her. I did the same pattern the top part of the jeans but for closing, I used the magnetic button so it is easy to finish it off. The Director was very happy with it. 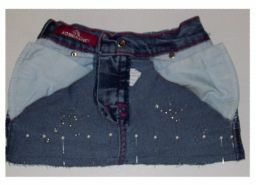 It is a very good idea to recycle the jeans into anything one can think of. So it is not thrown away. I love recycling it. 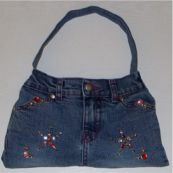 I had also made some tote bags and a handbag for myself and still with some scrap jeans. I also think quilting is a very good idea as well. I believe in waste not want not. Unfortunately, my daughters did not care about it and thought I am crazy to do it. have used old jeans for a bunch of things. Anxious to try your pattern. Goodwill sells jeans for very low prices, and for even less on their half-price days. Check out Goodwill or other secondhand stores such as Salvation Army and St. Vincent de Paul in your neighborhood. My daughter and I were involved in a neighborhood sale recently. She had a bunch of outdated (? 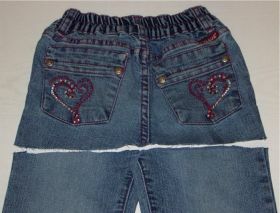 )jeans that didn”t sell, so I am going to try and recycle them. Thanks for the many suggestions. I may try all of them, as I have 10 grandchildren and another (#5) new greatgrand baby on the way.. The little bib is especially one that I will try, and a couple of the purse patterns look like something I could sell at a craft fair.. so must get my machine out and get busy. Also am a knitter, and love making hats on the loom. At 80, it’s good to keep busy!! I made one of the jean purses a few years ago. I picked a bright cotton fabric for the liner complete with dividers and pockets. I added a few beautiful silk flowers, beads, and pretty buttons for trim. The shoulder strap was made from left over jean fabric. I also have plans to make another one for my daughter-in-law who loves anything “John Deere.” The one I am making for her has the John Deere fabric lining and I found some adorable John Deere tractor buttons for trim. The sky and your imagination are the limit to decorating these. Your purses are so cute and very creative. I, too, believe in upcycling. I made a jeans bag for my niece several years ago and decorated it with ribbons, buttons, and iron-on decorations. I used a tube of glitter paint and wrote “Susie’s Stuff,” on the front. 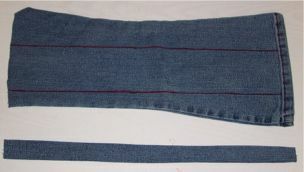 I used a pair of jeans that were fairly large and made the strap shoulder length. She used the bag the entire school year to carry her books, notebooks, pens, pencils, etc. from class to class and it held up beautifully. She loved it, and I felt pretty good, too! Great idea! I’ve been making jean purses for years. I steped it up a notch and added a lining to them with pockets inside. Used patches, lace, other trim, hand embroidery and buttons to jazz them up. I’ve made from the tiny tiny purses to ones large enough to be gym bags and they are hot sellers. Usually word of mouth gets the business, someone sees one and they order one. I found that special order ones worked the best for me, that way people were able to be part of the “creative” side of the purse. To find the jeans that I needed I would go to the local goodwill stores and or word of mouth to my friends who give me the jeans that their kids outgrow (including big kids)…..it has been a lot of fun and a different twist on the usual sewing that I do, recycling the jeans is fun and I’m always looking for new things to make out of the left over jeans. You can also make a bag out of the leg of the jeans. The opportunities are endless!!!!! What a great idea! And you could make zippered cosmetic bags out of the other pants leg to match the purse. Thanks! a minimum of 3%, companies will also have to be paid. insurance 62 when it comes to saving for retirement.